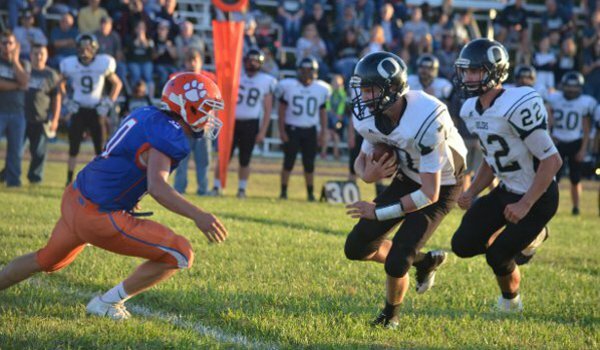 OTIS – Central Plains never led in the first three quarters and trailed 28-14 at Otis-Bison entering the final 12 minutes on Friday night. However, an Oiler staple is fourth-quarter victories. The energy immediately lifted when the third quarter completed. The Oilers, led by junior Alex Barton, sophomore quarterback Devin Ryan and a bevy of running backs, scored 26 unanswered points and delivered a 40-28 victory. “We worked hard in practice, and we brought it late,” senior lineman Trey Schulte said. With 2 minutes, 44 seconds left, Otis-Bison had a 3rd-and-5 from the Oiler 21-yard line. Cougar senior quarterback Kade Urban, brilliant all game, dropped the ball and then recovered the snap. He faced pressure and threw an interception in the middle of the field to Barton at the Oiler 10-yard line. Barton returned the play to the Otis-Bison 33-yard line. Then, he caught passes of nine and 22 yards to set up a 2-yard score from junior Dalton Beck for a 34-28 lead with 49 seconds remaining. The Cougars drove down to the Oiler 20-yard line before a sack and a clocked play yielded one final snap from the 26 with seven seconds left. Urban threw the ball near the end zone, and Barton intercepted and then returned for a 79-yard touchdown as time expired. Urban finished 11 of 15 passing for a career-high 193 yards and two scores with the two late picks. Otis-Bison, ranked No. 2 in Eight-Man, Division II, dropped to 2-1, while Central Plains, receiving votes in Division I, moved to 3-0. The squads battled injury and cramps throughout the warm, damp evening. Otis-Bison standout senior running back Brad Lightfoot had just two carries for one yard and mainly played defense because of an ankle injury. Junior running back Blake Bahr finished with 20 carries for 187 yards and two scores despite severe cramping. Otis-Bison, with significantly less depth than the Oilers, also struggled with cramps from sophomore starters Maitland Wiltse and Luke Higgason. Cougar players started downing pickle juice before the fourth quarter to help ward off the cramps. Central Plains missed senior running back Bryce Miller with an ankle injury. Sophomore Brett Liebl, a two-way starter, suffered from severe sinus headaches that might have caused a minor concussion. The Oilers discovered Friday that Liebl couldn’t play. Junior running back Anthony Oberle exited with a rib injury, and sophomore running back Alex Hickel suffered injury in the contest, too. Ryan completed 15 of 21 passes for 221 yards with two scores against one interception. Barton shook off some early drops and finished with eight catches for 103 yards and a score with five receptions in the second half. Beck had two rushes for six yards in the first half. Then, he had his second-half touchdown run along with three catches for 83 yards, including a 58-yard touchdown catch. Freshman Lawson Oeser, son of former Claflin standout tailback Jon Oeser, stepped in the second half and finished with three carries for 15 yards, including an 11-yard score that started the fourth-quarter comeback. Barton labeled Oeser the team’s fastest player. Earlier this year, Oeser had gotten banged up in practice with Schulte and had to regain health. He had a huge junior varsity game several days ago. Steiner wanted to save him for districts, though Oeser saw time because of the injuries. “For some young kids to come out of some adversity like that and play your first time ever in a game and to able to come back and win it down two touchdowns, that’s digging deep and having a lot of heart,” Steiner said. Still, Otis-Bison was in control up 28-26 and driving the field in the final minutes. Urban gained two first downs on rushes as the Cougars moved into the Oiler red zone before his first interception of the season. After Central Plains took the lead, Otis-Bison quickly moved the ball to the 20-yard line before two negative plays allowed for the last snap – and another big Barton interception.